At last, the talented but ever-underutilized Matthew McConaughey has found material worthy of him in Mud, the new feature from Jeff Nichols, director of the excellent Shotgun Stories. At its heart, the movie is about desire. 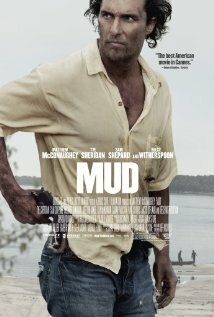 McConaughey plays Mud, a man on the run. He’s killed a man, killed for love. And now he’s bound and determined to get back to the woman he loves and run away with her. Maybe most movies are about desire, but most movies fail miserably at depicting it. It’s too often a given. The hero and the heroine get together for reasons that never really register onscreen. Here it’s as if every cell in Mud’s body is leaning toward the woman he loves. You feel it in every anxious glance. His life isn’t worth living without her. Unless it’s Member of the Wedding or To Kill a Mockingbird, I avoid movies with child actors as leads. Heck, I run screaming into the hills. But in the case of Mud, I have to say that Tye Sheridan as Ellis and Jacob Lofland as Neckbone do a better job than most adult actors in most other movies. The incredible thing is, you can’t see them acting. They aren’t smart-alecky know-it-alls or wise-beyond-their-years mini-philosophers. They’re kids, kids who have a hard time distinguishing between what they should and shouldn’t believe. The always excellent Ray McKinnon plays Ellis’s father, a man whose barely withheld frustrations sometimes seem about to boil over into violence but never do. That in itself is an achievement—a movie about the South that doesn’t paint its characters as idiots, racists, or grotesques of one stripe or another. Nowhere is this more apparent than in Michael Shannon’s excellent performance as Neckbone’s laid-back uncle. Shannon made such an indelible appearance in Jeff Nichols’s first movie, Shotgun Stories, and then promptly got cast in a number of big-budget Hollywood projects that had him not so much acting as screaming in various volumes. His performance in Boardwalk Empire is hard to take. And see the trailer for Man of Steel as an example of his adherence to the Al Pacino School of Acting. Lately, every time I’ve seen Sam Shepard in a small part in a movie, he’s seemed pissed-off that he has to be there. But here he does his best acting in a long time. It’s a secondary role but an important one, as Mud’s longtime friend and mentor. He’s an actor whose silences speak volumes. And then, of course, there’s McConaughey, who always plays the bad boy of one kind or another. But here his bad boy has a sharper edge. He’s driven by love, and you don’t know what he might do next. It’s easily his best performance ever. And though she isn’t on-screen a great deal, Reese Witherspoon does more acting in Mud than she’s been asked to do in a host of other movies. And she does most of it between the lines. She plays the white trash beauty who is the object of Mud’s desire. It’s a measure of the quality of her acting that she makes you feel both anger and sympathy for her, sometimes at the same moment. Mud is essentially a southern retelling of Dickens’s Great Expectations, with Mud as Magwitch, though that may be where the similarities end. It’s fascinating to me that Mud is a straightforward, realistic movie, and yet you’re never sure what will happen next. It’s full of suspense. Compare it, for instance, to After Earth. Set in the distant future, and partly in outer space, you’d think that you’d never know what will happen next. But in fact, it’s completely predictable. It doesn’t make a move you couldn’t have predicted two days before you went to the theater. I saw After Earth two days ago, and I forgot all about it as soon as the lights went up. I saw Mud two months ago, and I’m still thinking about it. That’s good movie-making. Mud, a fine movie and not to be missed.